I'm not normally one who likes a series to come to an end--especially when I've thoroughly enjoyed the series! 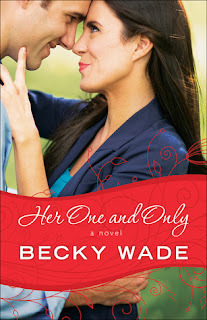 However, Becky Wade's final book in The Porter Family series centered on the youngest Porter (and only girl), Drew. I've waited for Drew's story through each book, so in this case, while ending the series was bittersweet, I was extremely excited. Here's a small blurb and we'll chat on the other side! I'll start off by saying what fun it was to get to know Drew better in this book. She's played so well as a support in her brother's books, and we've watched her grow up into the woman we see on these pages. And while having seen Drew before enriches your read of Her One and Only, Wade does an expert job of making new readers welcome. If this is your first book with the Porters, you won't feel lost. Drew is a very strong female lead which lent itself to the need of a strong male. Wade delivered. And while Wade writes heroes for a living, she never makes them cookie-cutter. It's an aspect of her writing I love. Dipping into the world of the NFL, you can tell she researched players and teams which only added to the depth of the storyline. Gray was as well fleshed out as Drew and the two create a dynamic on page that keeps the reader turning pages. Adding a hint of suspense to this book only brought freshness to the pages. It wasn't something one expects in a Wade novel, but it was perfectly placed within these pages and well done. It never overshadowed the romance between Drew and Gray which remained center court. As typical with a Wade novel, the secondaries provide a richness to the story that make each scene enjoyable. And while I loved seeing every Porter, at times those threads took me from the main story. It was a hard balance to strike--bringing a full ending to the Porter family while also telling Drew's story. When I put the book down after the last page, I couldn't imagine it being written any other way What a perfect bow to one of my now-favorite series. I happily give Her One and Only 5 out of 5 stars. You can purchase it here. I thank NetGalley and Bethany House for my copy of this book in exchange for my free and honest review.